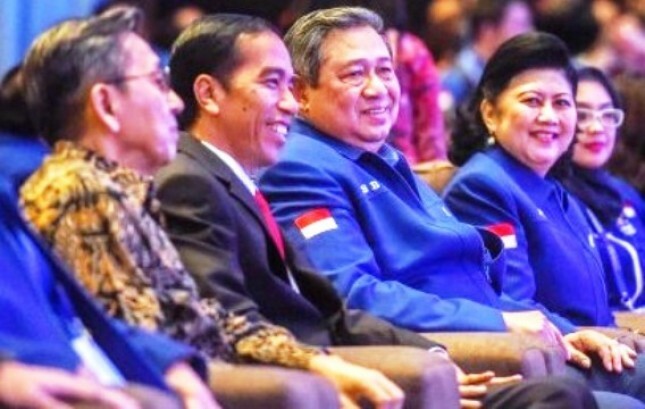 INDUSTRY.co.id - Jakarta - Chairman of the Democratic Party who is also the sixth President of Indonesia Susilo Bambang Yudhoyono signaled his party's readiness to support President Joko Widodo in the 2019 presidential election. Although SBY declared the Democrats have not yet determined the presidential and vice presidential candidates to be held in the 2019 election, in his speech, he repeatedly displayed a signal of support for Jokowi. "Insha Allah Democrats in 2019 will carry the most appropriate and the best candidates for president and vice president in the future," said SBY in the opening speech of Rapimnas Democrat at Sentul International Convention Center, West Java, on Saturday (10/3/2018) started a signal of support for Jokowi. SBY then convey the hope to President Jokowi in order to successfully complete the task and dedication until the end of 2019 service period with the results and achievements as high. SBY also pray that in the 2019 election Jokowi can reap success. "Hopefully, in the 2019 presidential election, he also succeeded in accordance with your expectations and wishes," he said. He went on to say that the challenges facing Jokowi's government are similar to the challenges facing the SBY administration in 2008. The challenge faced, namely the economic turmoil before the presidential election. SBY optimistic Jokowi government will be able to overcome these challenges as previously successfully carried out government of United Indonesia Cabinet II. SBY then talked about destiny. He mentions that if Allah predestined, Democrats can fight with Jokowi. "If God is predestined, the Democrat can really struggle with you, of course you understand as much as my experience in the 2004-2009 presidential election, whatever joint struggle his name will succeed and win if the framework of togetherness is right," he said. SBY said the joint struggle or coalition will succeed if the vision-mission of its governing platform for 2019-2024 is also appropriate and arranged together.